Horizon Slide Navigation Plugin: What is it? 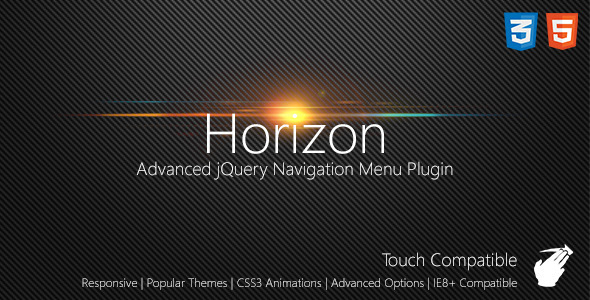 Horizon Menu is a dedicated jQuery plugin where you can create custom menus that slide beautifully in your web browser. It’s reponsive, meaning mobile first. Mobile and tablet UI is fullscreen meaning it’s user-friendly and easy to navigate. Whether you’re using it for a web application or your own personal website, it’s a great little yet huge navigation plugin for anything you need. Horizon also includes sub-menus so you can create multi-level drop downs for easy access. The scrolling is smooth and flexible, and thank to its complexity, this means you can add as many menu items as you desire; even if your browsers height simply isn’t tall enough to fit them all in, the scrolling is there to help you. Last but not least, Horizon is fully touch-ready for all modern PC’s, tablets and mobile devices meaning you can scroll smoothly through the menu. It’s as easy as it gets. Upload, link files, paste some code, edit to your needs, done. Comes with 120+ beautiful icons, 10+ CSS3 top quality CSS3 animations and 6 beautifully crafted CSS themes in which you can create your own to fit your needs. Need help using this? The online documentation is here and ready to use straight away. If you’re still feeling lost from thereon after, don’t hesitate to contact me. Please be aware before purchasing: CSS3 animations only support IE10, but to solidify this plugins development, IE will gracefully degrade to jQuery animations.